Happy Easter 2016 Ladies (and Gents)!! Today, since I haven't posted since Wednesday night (due to being extremely busy) I decided to do a little catch up post and show you some Easter-related things. Hope to bring some Spring Inspiration your way. 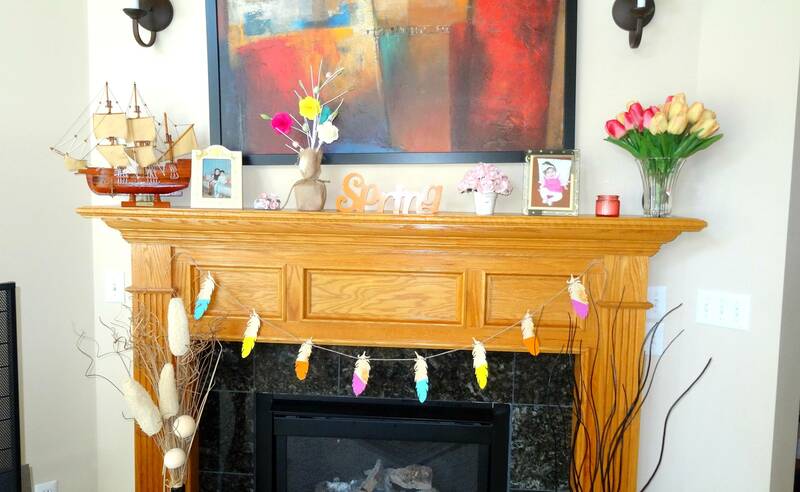 I have mentioned before on the blog, that I liked to decorate the mantle and fireplace area as much as I can for the major holidays. 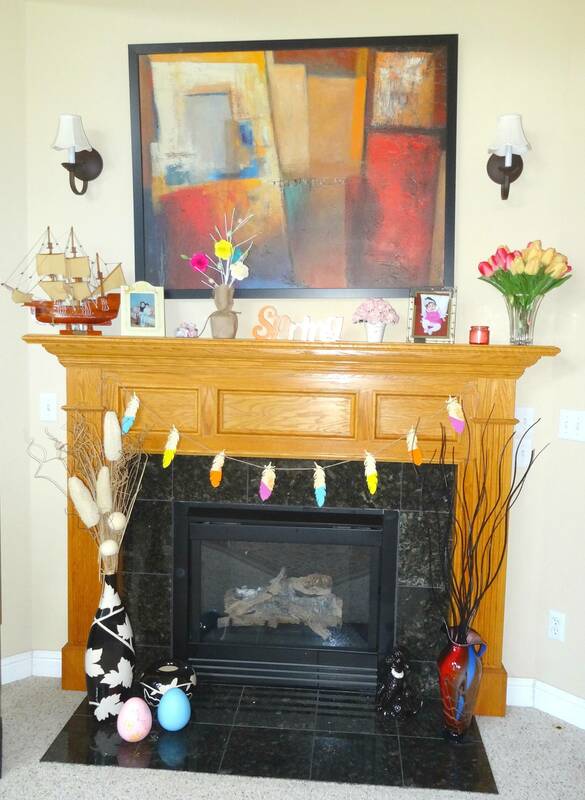 As you can see my mantle got Springified and ready for Easter. At first it looked like this (I shared a photo on my Insta). Well, I changed the look a little, took off the lavender heart wreath (made of real dry lavender flowers), left the leafy colorful banner there. I took off the two big eggs from the top of the mantle and placed them on the bottom instead. I put a vase of pink+yellow tulips on the mantle because tulips to me are the ultimate Spring Flower, a tiny white pot of rose quartz (soft pink) roses, a Spring sign in the middle, a little pastel egg tree (purchased at Target) to which I added the 4 colorful paper roses also purchased at Target and the ship which is usually part of the mantle, is placed on the left side. And of course a picture of Vivian as a baby is always part of the mantle. The other photo in the pretty Bunnies+Eggs+Flowers Disney frame is of my brother and I when we were kids. It was taken on a photo-shoot we had at home with a photographer when I turned 15 (my brother was 10 and a half). And the candle in the pink vase smells like Spring too. 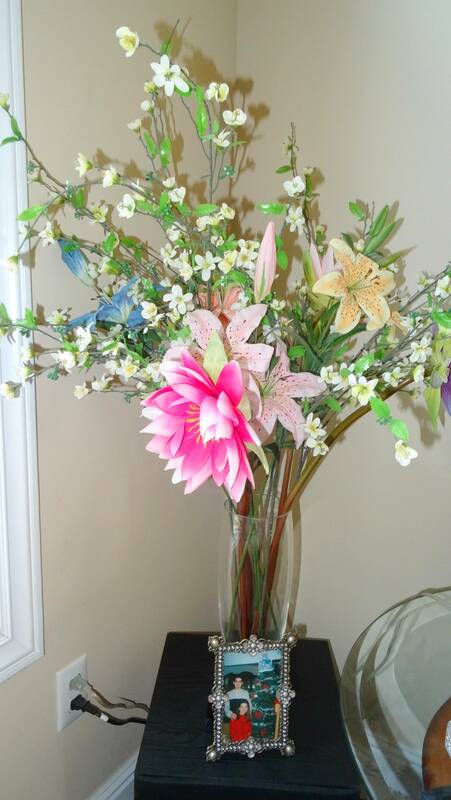 In one of the corners of the living room, you see the large clear crystal vase filled with lots of lilies, calla lilies, baby breaths and other Spring flowers (fake, but they still look pretty). 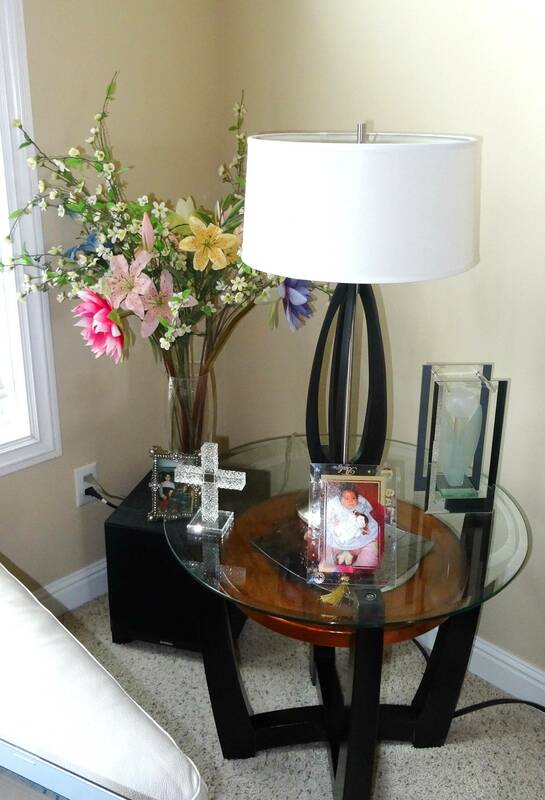 Over the circle glass table, there is a crystal cross (perfect for this time of the year for Easter) and also that gorgeous rectangle object is made of glass and has a stunning pearlized glass tulip inside. 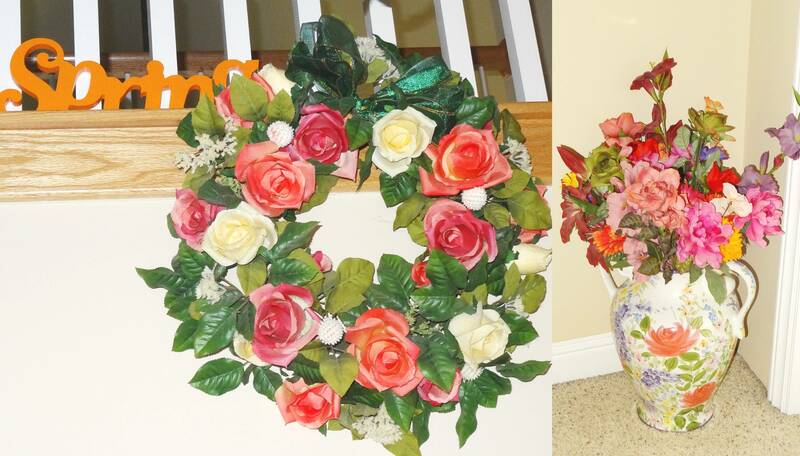 I really, really wanted to make a wreath for Easter or Spring but I have been so busy you guys, working full-time, being a housewife and a mom full-time and blogging full-time pretty much. Since our Easter is weeks away and Spring has just sprung (no pun intended!) there is still time for me to do a wreath. 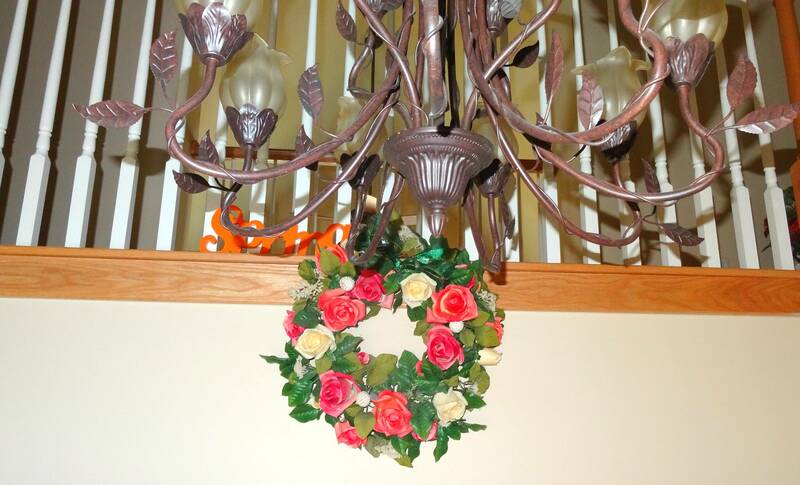 For now, that colorful rose wreath hangs from the rails of the stairs and I also added another one of those Spring signs from Target (they were a great deal for 3 bucks each!) And on one of the corners of the hallway upstairs, there is that gorgeous white porcelain vase (painted with flowers) filled with all kinds of different flowers in multi colors. 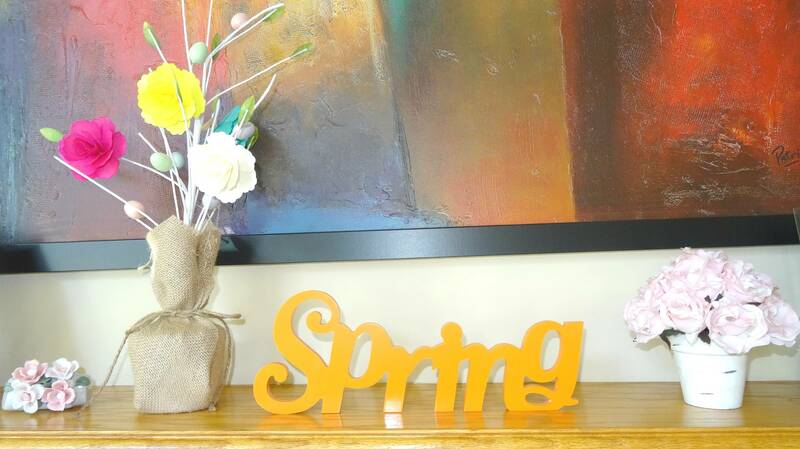 I love adding different vases of flowers to the house for Spring and Summer and at least once a month or bi-monthly, I usually buy a big bouquet of real flowers too. 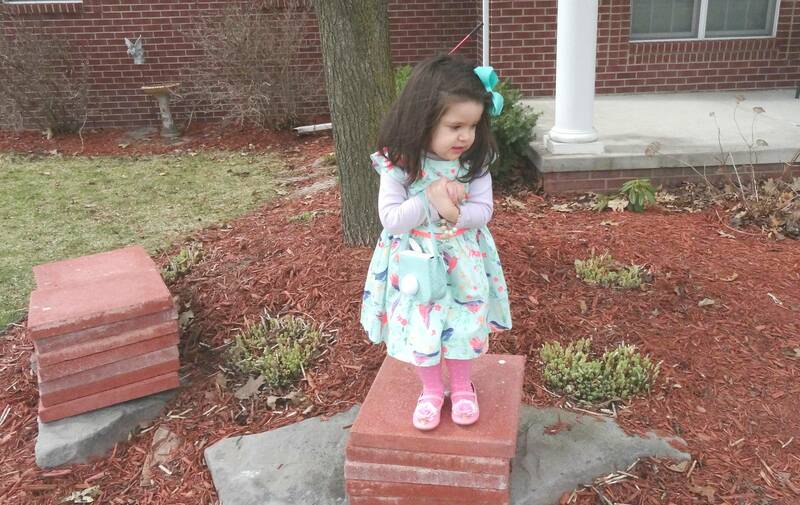 Easter is the perfect holiday for Vivian because she is obsessed with eggs and ducks. She also loves colors, bunnies, flowers and birds. Speaking of eggs, she loves eating them too. And before we cook them for her, she likes to crack them open herself and then with my help she stirs them on the bowl. I always add a little bit of feta cheese and milk to her eggs and scramble them for her. She loves fried eggs. When I saw those large pastel eggs (baby blue and baby pink) at Target for $1 each, I had to buy them for her to decorate, especially since this little girl loves drawing and painting. 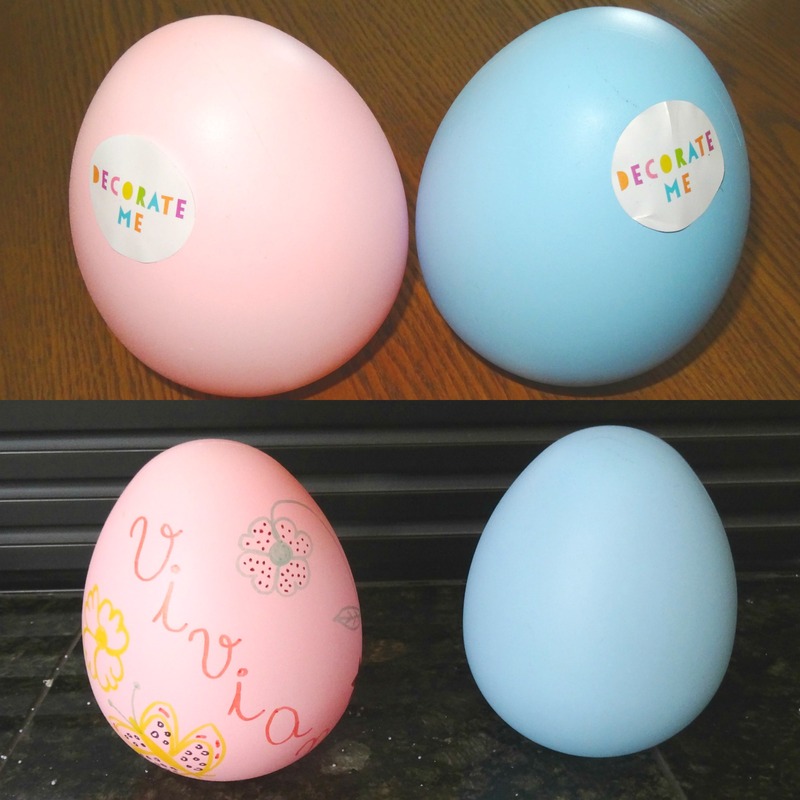 I already decorated the baby pink one for her using different colorful permanent markers. I will let her decorate the blue one herself with different markers and stickers. 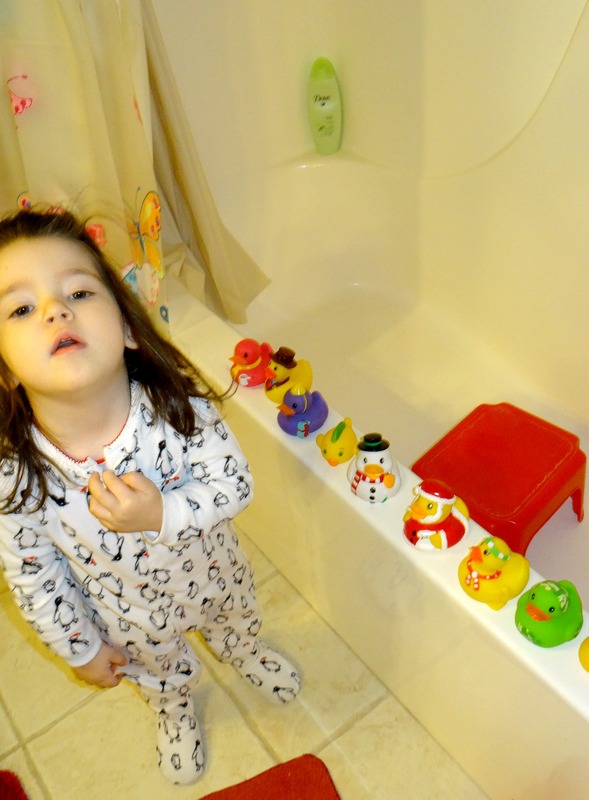 And, last but not least, Vivian's collection of rubber ducks got a couple more new Easter ones (the hot pink and the green). 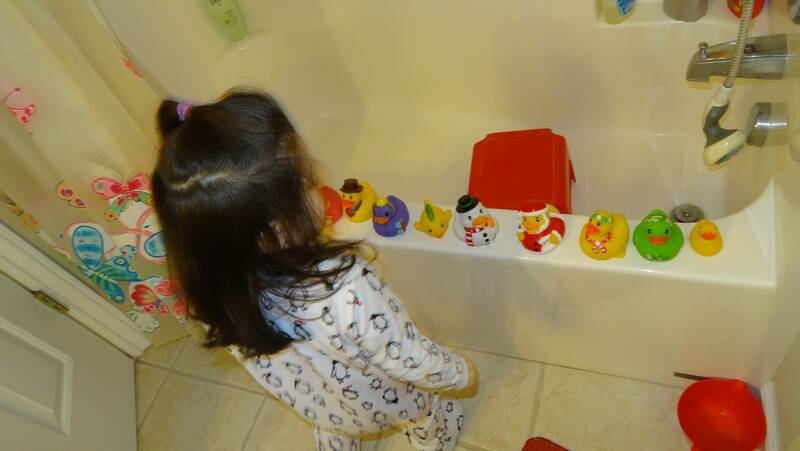 She puts them together in a row before she is ready to take a bath. The ducks always take a bath with her, too. 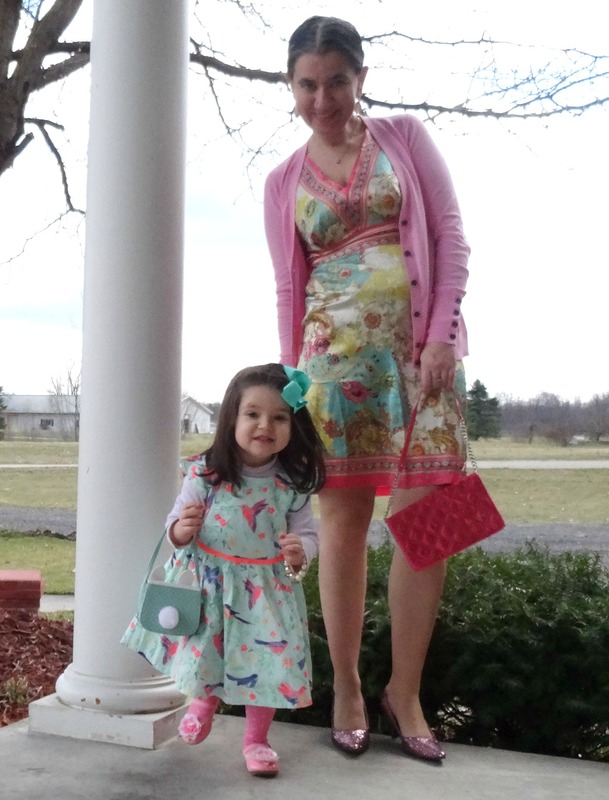 In the beginning of the week I shared the above Easter outfits for Vivian and I. We mixed and matched patterned dresses in Mint with Pink. Her Dress has a Bird Print with Flowers and mine is a Floral+Paisley Print. But, I didn't stop there. A few days ago when we took Vivian to the mall to see the Easter Bunny, I stopped into Gymboree and the entire store was on sale. 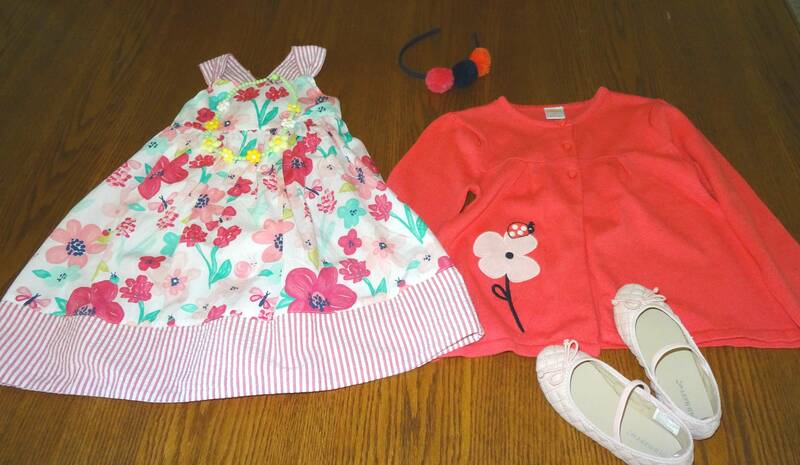 I purchased her yet a new outfit (first picture below): dress, cardigan, necklace and pom pom headband. The Baby Pink Ballet Flats are by Old Navy (purchaseda few weeks ago). I also purchased her some chiffon floral sandals (not pictured) from Target, almost identical to these to wear with her new dress. And last but not least, from the 'Dollar Spot' at Target I purchased a Floppy Straw Hat and little Straw Purse for her. Most likely, this second outfit will be worn by Vivian for our Easter on May 1st. This is what I got in my latest Rocksbox. The stylist did a great job sending the Amethyst Necklace because this piece is perfect for Easter and for all Spring (plus Summer). 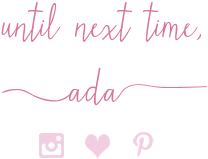 Use my special code to get a free month of Rocksbox jewelry delivered to your home: ADABFF39. And this is what I am currently wearing today for Easter. My Babydoll Floral Silk Dress is old but the Ghilly Flats and Saddle Cross-body Bag are both new from Target; they were all buy one, get one 1/2 off this pst week. 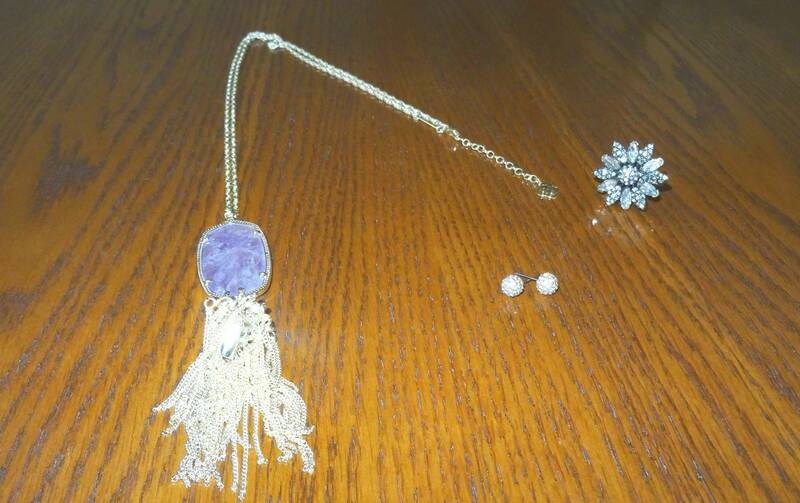 I paired them with my latest Amethyst Rayne Necklace and a couple of Colorful Tassel Bracelets from Pumps & Pushups Collection. I am obsessed with these Kendra Scott necklaces, I received my Lilac one from my latest Rocksbox (second picture above). This is my second Rayne necklace. I also own the Emerald Green one and I think I want the Hot Pink one, too. 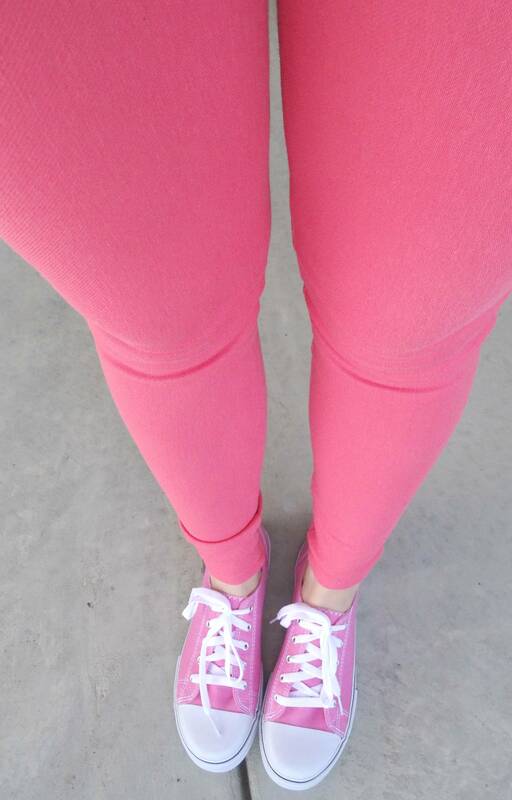 Don't these Hot Pink Converse Sneakers read Spring? Especially paired with Bright Coral Leggings. 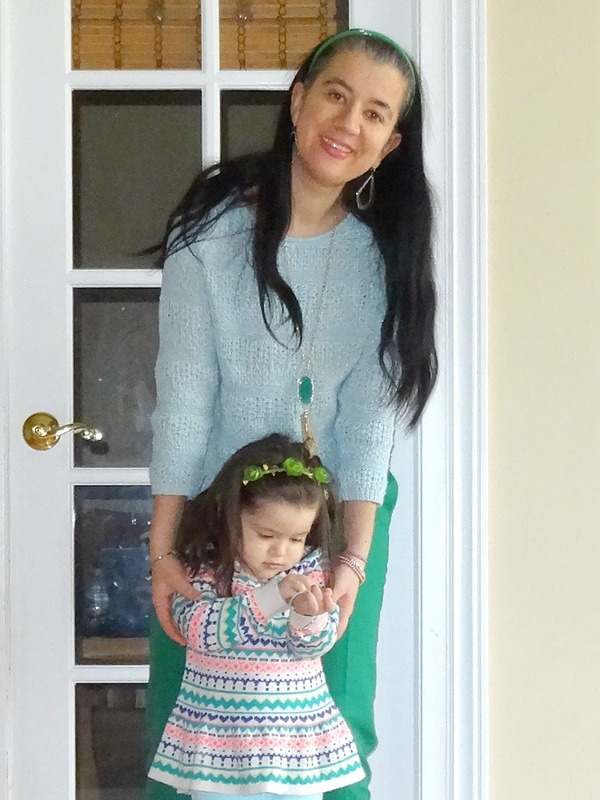 Vivian and I did another version of Coordinated Outfits in Mint, this time a little more casual. 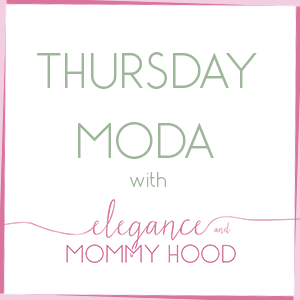 You will see a lot of these outfits on the blog in the next few days and some of them, next week. 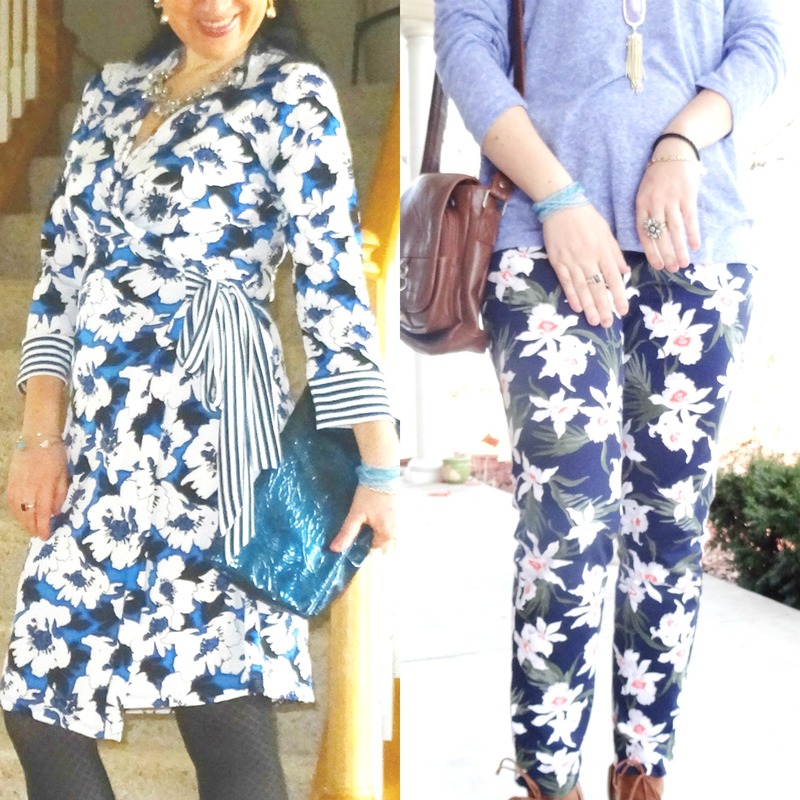 Last but not least I styled some Blue+White Florals this week, inspired by Easter. First (on the left) a Dressy 'Work' Look and second (on the right) a Casual 'Mom' Look. Hope you have enjoyed this post today. 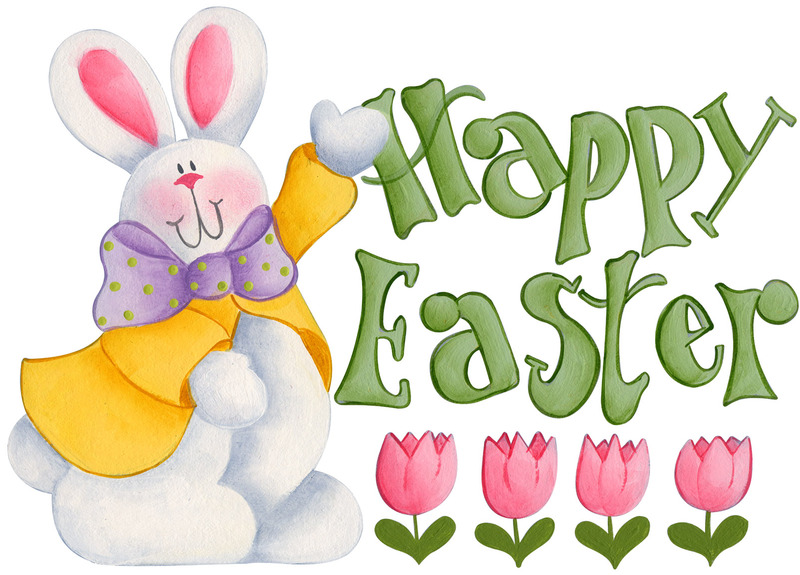 What did you do, eat, wear, buy this Easter? P.S. I am linking up with Ann, Amanda, Angie, Betsy + Katey, Biana, Carly, Carrie, Carrie with Whitney, Caryl, Cheryl with Kristin+Megan & Nicole, Claire, Debonita, Erin, Good Random Fun, Grace, Lauren, Leelo, Molly,Patti, Rachel, Rachelle, Sandy with Kileen, Whitney and Zaz.